All transactions are safe and secure with a reliable history in online purchasing behind each of our associates. 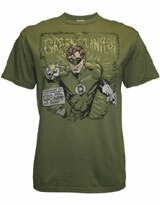 Buy the Green Lantern Oath t-shirt to own Green Lantern clothing and merchandise. Show everyone how glad you are that your favorite superhero and Justice League member has been brought into the spotlight by acquiring this comic style clothing item. This vintage style Green Lantern Oath shirt features a portion of the Corps Oath, "In brightest day, in blackest night, no evil shall escape my sight." To see through the dark of evil, take a look at the Green Lantern lantern in the gallery. In addition to the Green Lantern Oath tee above, browse the Green Lantern Clothing Gallery for more apparel like men's and women's clothes, kids shirts or hoodies.